The kids are back in school! Finally, I have the house to myself during the days so that I can actually get some editing (and chores) done! But, it’s not all sunshine and daisies, because with the new school year comes…parent-teacher conferences. No, I’m not talking about the one every parent is invited to attend in November to review quarterly process. I’m talking about the one for ADHD kids. You know, the one that happens less than a week into the new school year. Every single school year for my family starts out the same. For the first week of school, my son is a mess. The newness of his classroom, teachers, classmates, concepts, schoolwork, routines, and expectations….combined with the fact that he was out of school for three months means that every autumn, he spends the first two to three weeks relearning how to be a student. When I get the inevitable emails and phone calls from the teachers and principals in the fall that my kid is acting out and being unmanageable, I am never surprised. As a matter of fact, I typically send an email to the teacher a couple days into the school year about my son to open up the lines of communication. This year is not an anomaly. In fact, this year, I got an “invitation” to come for a parent-teacher conference exactly a week after the first day of school. Is there good reason for the teacher to schedule one so early? Absolutely. My son struggles a lot and finding ways for him to be successful in the classroom while allowing the teacher(s) to educate an entire classroom of students is important. Addressing those issues as soon as possible is a good thing. 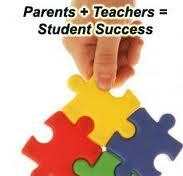 Even if those issues naturally decrease as the school year wears on. It’s good for the teachers and school staff to understand the unique issues my child faces in the new educational environment. It is equally important for me, as a parent, to understand the challenges the teachers and other students may be facing as a result of my child’s unique issues. I imagine myself as a teacher in the situation and think about what I would want to address with the parent and what kind of results and relationships I would hope for. I hope that the teachers would do the same for me, but it all starts with a positive attitude. As a parent, it would be completely understandable for me to be nervous when the teacher suggests that we meet. Even more intimidated when the teacher suggests the inclusion of the principal, guidance counselor, and/or other staff members to join the meeting. It is common to feel “under attack” and fall back into a defensive posture. A positive attitude is essential. These people art part of the team that have the potential help my child succeed. They have a vested interest in working with me and my son, because it affects their day-to-day lives and their ability to work efficiently. Don’t get me wrong, if I have to put on my “Mama Bear” hat and growl at some teachers, I will. Protecting my cub is one of my main jobs (that and “bear hugs”), BUT I want to avoid growling at people unless they are actually a threat to the education of my child. Growling sets the wrong tone. A bad attitude can set my meeting up for failure before. Why? Sets up the impression that I do not care about my child’s education. Can put teachers on the defensive, assuming that I will not be cooperative. Teaches my child to react negatively when nervous. Shows my child that I am not willing to try. Creates a Teacher v. Parent/Child atmosphere. Prevents any actual goals from being discussed or developed. I have the advantage of being very active in the school. When my son was in Kindergarten, I joined the PTO. After years as a parent, PTO member and volunteer, most of the school staff knows me and my child. Even when I worked full-time at an office, I was involved, which helps because it makes my commitment to education and working with the school well-known. Many parents seem to incorrectly assume that the point of the parent-teacher conference is to go listen to your child’s teacher tell you about your child. It’s easy to forget about the parent half of the conference, in which the parent gets to share information and ideas. I would even argue that this is the most important part of any meeting. It’s the part where I, as the parent attending, get to voice MY concerns, goals for my child, and give suggestions on how to work with him. I’ve been his parent for almost 9 years, so I am an expert on my son. His new teachers NEED my help to find ways to help him (and themselves) succeed. I have learned to come in prepared with my thoughts, ideas, suggestions, and positive attitude. This year, the particular makeup of the group involved though is pushing me to do something new. My younger son has an established IEP at his school. The 504 Plan is similar to the IEP, in that they are both blueprints or plans for how a child will have access to learning at school. A 504 Plan aims at providing services and changes to the learning environment to meet the needs of the child as adequately as other students. We have not pursued it in the past, since none of my son’s ADHD behaviors seemed warrant interventions. However, as school work and expectations increase, a 504 Plan could help with challenges in the classroom. The inclusion of so many staff members in the meeting is the perfect opportunity to request a 504 Plan (which starts the ball rolling on an evaluation process). It’s possible that one of the reasons that they want to include so many people in the first place is to suggest that to me anyway. I am at an advantage, because I have experienced many IEP meetings already. IEP meetings are round table style “discussions” where the school recommends goals and indicates how much of a particular service my child will receive. As parents, we can suggest changing goals, increasing services, etc. to help our child. Which means that I am used to meeting with multiple staff members simultaneously to work towards a common goal. Like many people with ADHD, my son is intelligent. In some subjects, he is likely ahead of most of the class (math), but because he is neurodevelopmentally behind his peers, seeing those skills can be challenging. It’s sometimes like my 3rd grade child has the educational potential of a child in 5th grade, but the social-emotional level of a 1st grader. For example, I told my son’s teacher that he already knows how to multiply. She was never able to see that potential in school, because my son was not completing or turning in classwork. ADHD wasn’t affecting his potential, it was affecting his ability to express it. With the inability to focus on his tasks, his success is hard to measure. Unfortunately, our highly structured, standardized education system, which requires all students to sit quietly at a desk, listen and do independent work for several hours a day can be the worst possible environment for ADHD children. Luckily, I am more than willing to work with the school to develop strategies, reward systems and any other problem-solving that is required.